There’s a Korean foodie defense to the summer onslaught. Fight fire with fire, by devouring steaming hot stews or fight fire with ice by gorging on chilly but tasty noodles. 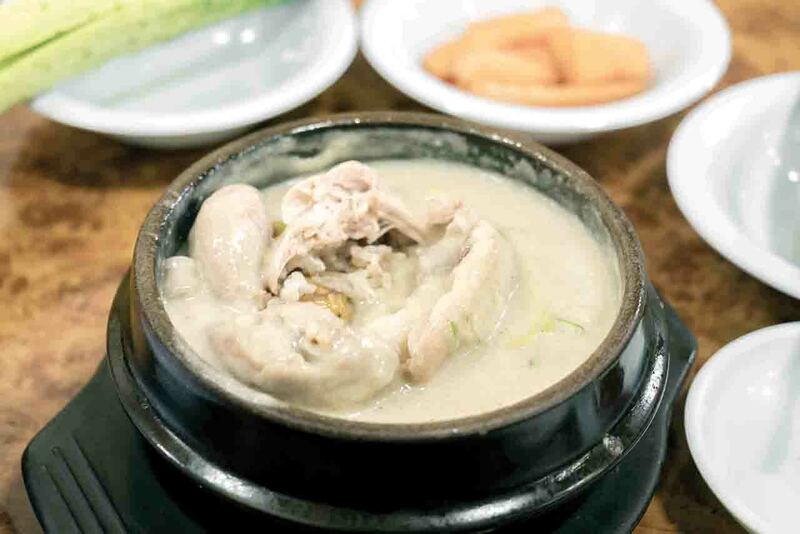 Koreans line around the block to get a bowl of piping hot ginseng chicken stew or samgyetang in summer. It’s such a popular tradition that some foodies advise against it on boknal (the three hottest days of summer). They say that the quality of the chicken is poor on those days because of the overwhelming demand. That’s why it’s important to choose a consistently high quality samgyetang shop, and Hosoo Samgyetang is one such place. 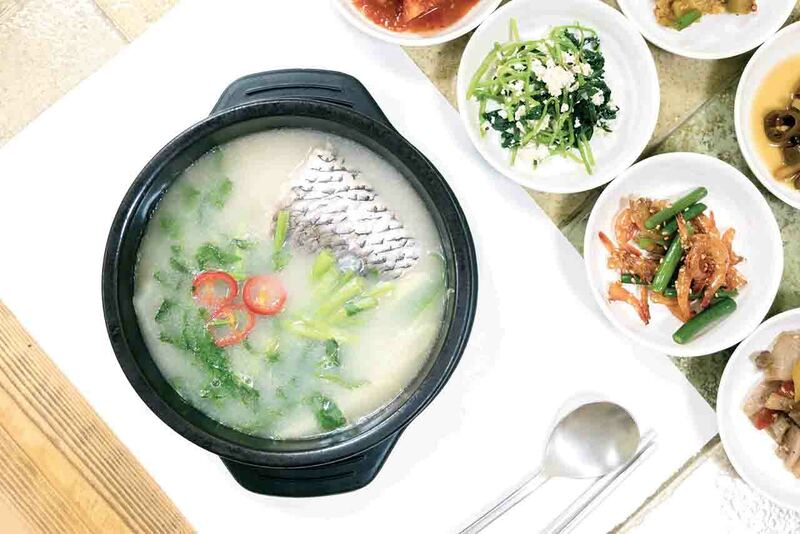 Some diners may not find the samgyetang here very appetizing. Their signature dish, samgyetang with perilla seeds, is not much to look at. A light brown broth covers the small whole chicken filled with chapssal or sweet rice, ginseng, chestnuts and jujubes. The distinctive flavors of the broth balance out the bitterness of the ginseng and the gamey smells from the chicken. Koreans believe the broth made with perilla seeds, peanuts, and chapssal flour is particularly good for women with a weak constitution. The thick broth may be a little too rich for some samgyetang traditionalists but there’s a banchan solution. The long sticks of fresh cucumber, dipped in gochujang, provide a spicy counterweight to the samgyetang broth. Each bowl of samgyetang is served with a simple banchan set of cucumbers, garlic slices, chili peppers and radish kimchi. Another popular nutritious or bosin summer dish is the mineo, otherwise known as the croaker fish, named so because of the unusual cries it makes underwater. These cries are made through its air bladders, and Koreans find these bladders make for a special summer-time delicacy, served as a topping for a fresh hoe-deopbap or boiled into a spicy tang or stuffed with sea urchin roe and steamed into a soondae. 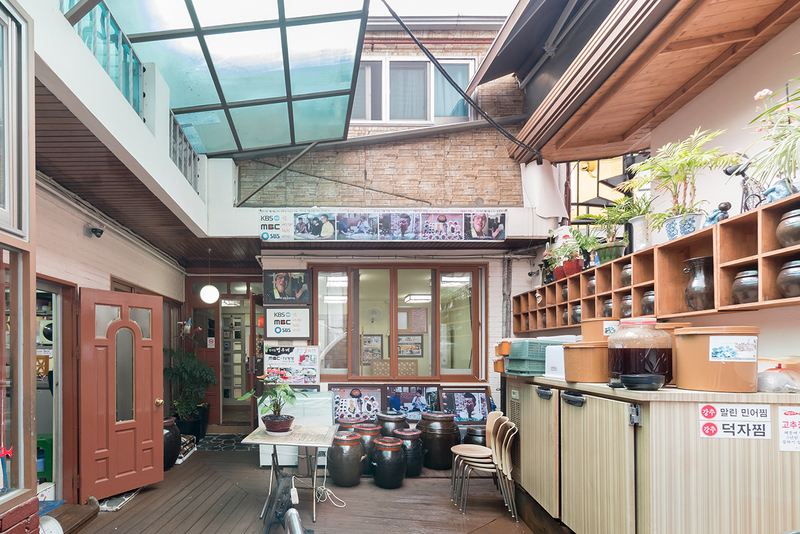 Byungwoonae is a Jeolla-do restaurant that specializes in everything to do with the mineo. They offer mineo in every imaginable form, freshly sliced, steamed, boiled, braised, grilled or pan-fried. 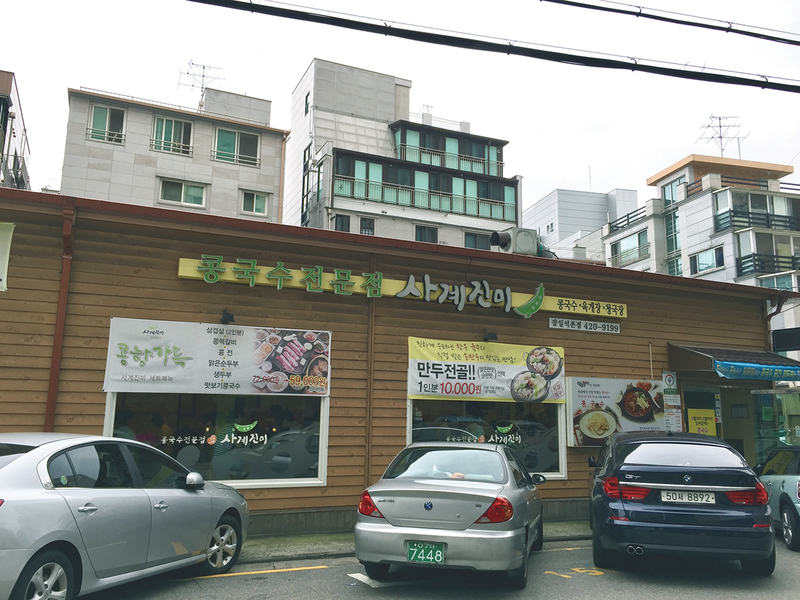 Fresh mineo hoe can cost a pretty penny so if you’re looking for something more affordable, try Byungwoonae’s famed mineo stew or mineojiri. Unlike the usual spicy maeuntang, the mineo stew is mild in taste but boasts rich, savory flavors as the broth is made from boiling fish bones for hours. It’s a popular hangover stew that’s served with a delicious assortment of banchan dishes that are refilled upon request. Make sure to mix your bowl of rice into the stew to finish every last drop of the delicious and healthy soup. Not all Koreans prefer to sweat out bad chi by eating a piping hot stew. Some prefer a well air-conditioned noodle shop where they can dine out on a cold dish that’s equally nutritious and delicious. 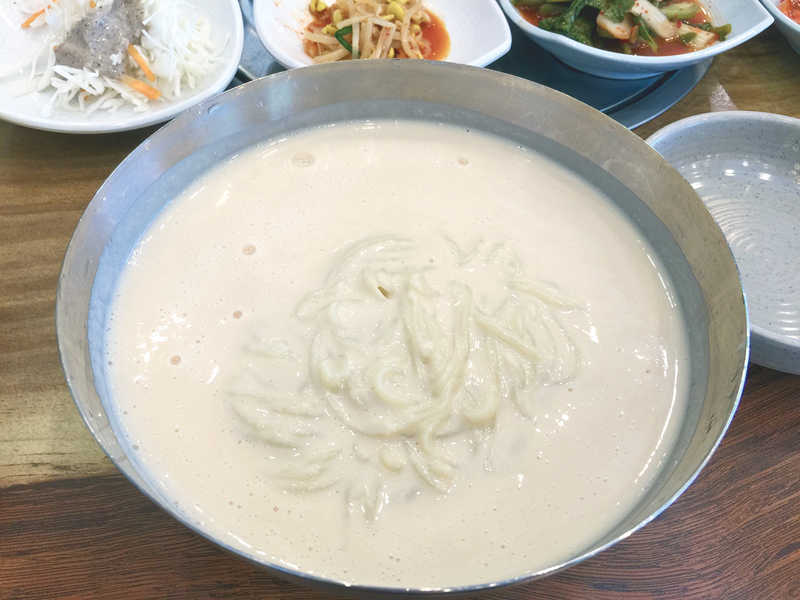 One such popular summer-time dish is noodles in cold soybean broth or kongguksu. Soybeans provide an exceptional source of vitamins and minerals and are a great protein alternative to meat. Kongguk is made from soybeans ground with water and is often just seasoned with a little salt. This simple dish is the highlight of the menu at Sagyejinmi. Actually, it’s not easy to make great kongguk, with great texture but with none of that funky soybean smell. 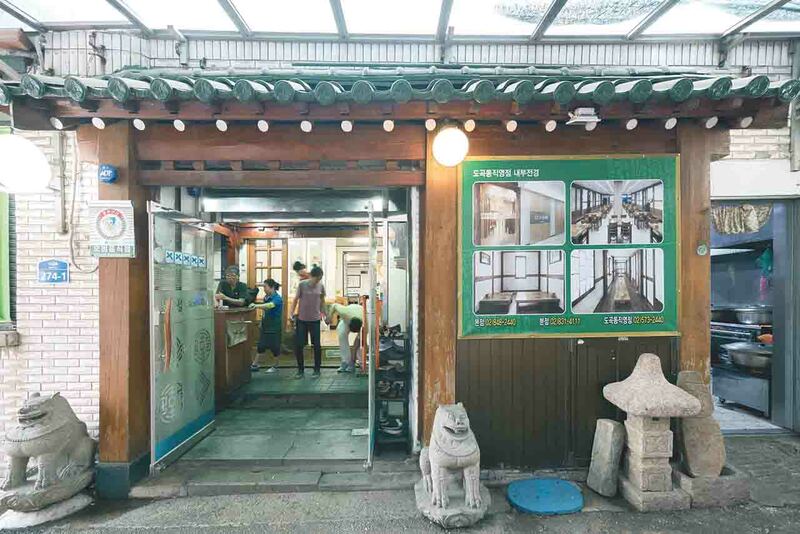 At Sagyejinmi, the soybean broth is done so well that customers often buy bottles of the broth sold on site, after finishing their kongguksu meal. The broth is so thick that it’s hard to make out the noodles underneath. 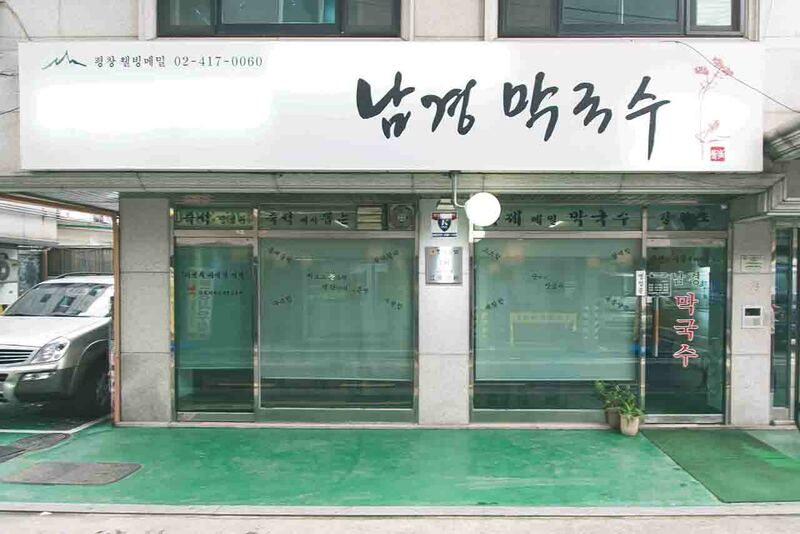 The restaurant specializes in soybean or tofu dishes including soybean pancakes and grilled soybean patties kongtteokgalbi that go well with kongguksu. 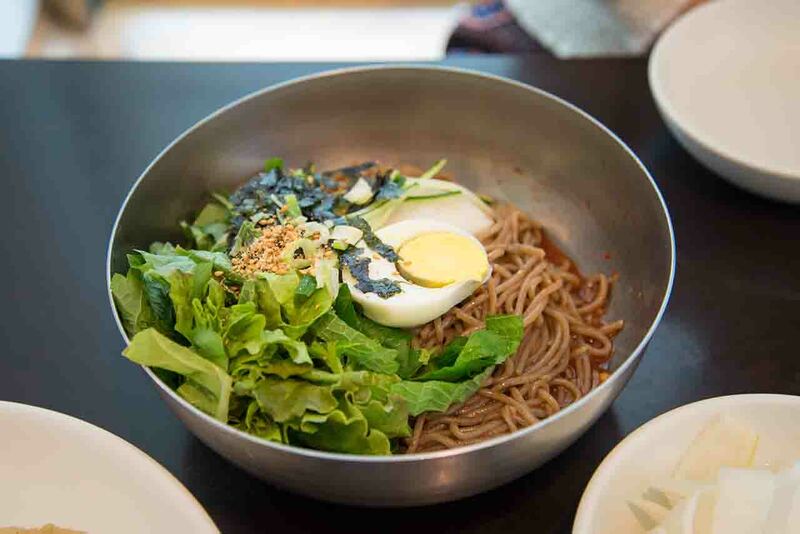 Namgyeong Makguksu is an unusual noodle shop that regularly tops foodie lists for cold noodles. But it’s not easy to become a regular. 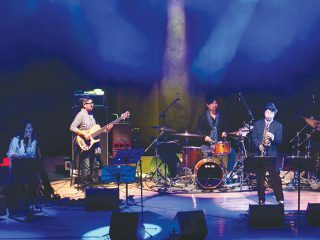 First of all, it’s difficult to find, tucked away in the small alleyways near Sincheon’s Saemaeul Market. Then you’ll find that parking is impossible, and the lineups in summer can be intolerable. Lastly, even if you do find yourself a table, you may be more than a little irritated by the slow and uneven service. Nonetheless, the memories of the fragrant buckwheat noodles like some Proustian madeleine effect, make you return again and again. The makguksu here is closer to Pyongyang naengmyeon in that the cold broth is very mild to the point of blandness. In fact, the owner remembers many customers leaving, while cursing about the “tasteless” noodles. But some return, hooked on the fragrant buckwheat noodles that are handmade to order by the owner and noodle-maker. If the noodles in cold broth or mul makguksu is not to your liking, try the spicier bibim makguksu or noodles mixed with vegetables in a tangy gochujang sauce. The potato pancakes with strips of cabbage are especially good with a bottle or two of makgeolli.